For those that shy away from plastic snaps and quick-release buckles. A simple, 3/8 inch belt neck strap to use as a direct connection to 3/8 inch eyelets. Optional Split Ring adapters available (nickel or brass) for cameras with smaller eyelets. 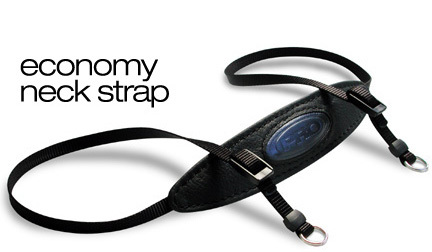 Features a soft suede inner pad for a comfortable and cool fit against the neck. Generous 50 inch belt length allows for fantastic adjustability.